The UVMax Pro models are all NSF Certified and guarantee proper UV disinfection to the required 40m/J for complete disinfection of your water. 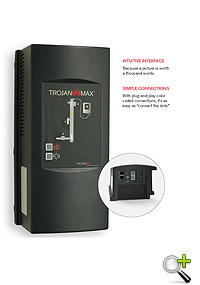 Include the lamp-age display and alarm system w/reset button. They also include a UV intensity monitor, which is used to keep a close eye on the amount of UV you are getting into your water. The unique design also offers a digital diagnostic display for ease of use. Optional com center and solenoid kits are available. Install a UV Max disinfection system and you no longer have to be concerned about waterborne pathogenic organisms causing illness. UV systems kill bacteria, viruses, and other pathogens by preventing them from reproducing. Viqua has led the development of water treatment solutions using environmentally friendly ultraviolet (UV) light. Viqua has the largest installed base of UV systems in operation on the planet, and many of their innovations define the industry standards for safeguarding your water from the damaging effects of microbial and chemical contamination. UV lamp now lasts 2 years! Twice as long as any other UV system. The UV sensor is designed to detect a change in the UVT (Ultra Violet Transmittance) in the water. This will help make sure the UV is providing the necessary UV dose to inactivate the bacteria in the water.Note: If the UVT of the water falls below 75% that will send the system into alarm and "tripping" the solenoid valve stopping the flow of water to the house. 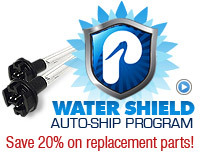 The Cool Touch fan significantly reduces the water temperature without wasting any water. This will help reduce alarms for water "over heating" and triggering the sensor. Recommend in situations where water is not being used on a regular basis. Q. What does the Pro model have that the Max or Plus models do not? When you purchase a Pro model UV system, you are getting the same great UV disinfection the normal model has, but with added peace of mind and security. 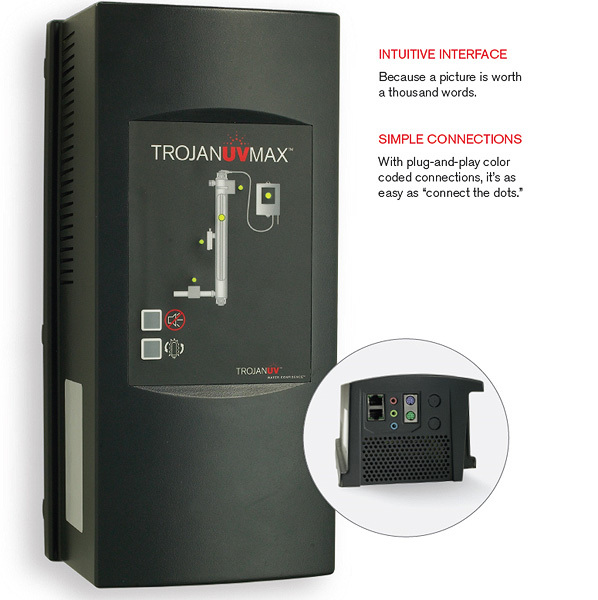 All Plus models include the lamp-age display and alarm system w/reset button. They also include a UV intensity monitor, which is used to keep a close eye on the amount of UV you are getting into your water. The UV Intensity Monitor is required in some states when installing a UV (contact your water company or building inspector) and will ensure that you are getting proper disinfection. If the UV intensity begins to drop, then you know its time to clean the sleeve or replace the lamp. Another added safety feature is NSF certification that this UV system will guarantee you proper UV disinfection by use of a flow restrictor preventing you from pushing too much water through the system. This NSF certification will ensure the required 40m/J level of UV for complete disinfection of your water. CoolTouch may be required for your installation. Q. What is a CoolTouch and why would I need it? A CoolTouch system is needed for all UV systems that have UV intensity monitors where water is not in use 24/7. The CoolTouch will move water through the UV chamber to reduce the temperature of the water. If the water is allowed to get too warm, the UV intensity monitor will show that the UV intensity is too low and set off an alarm. This CoolTouch helps to prevent that alarm from going off and also keeps the water cool inside the chamber. Since the UV lamp is always on, if water is not in use all the time, adding this is a requirement. Q. Is there a lot of maintenance required with a UV system? All you have to do is periodically clean the lamp sleeve and replace your lamp once every 2 years - simple processes you can complete in minutes. For ease of handling the lamp and protective quartz sleeve are designed as one component, but can be replaced separately. No tools are required for maintenance. Q. 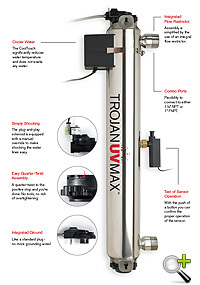 What type of warranty does the Viqua UV Max Systems come with? 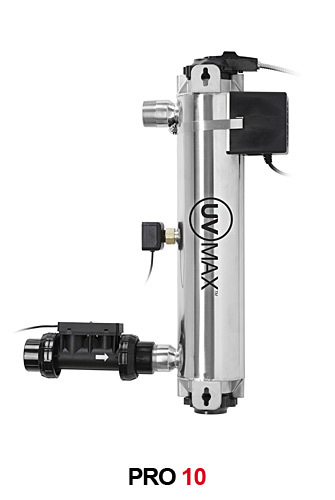 The Viqua UV Max comes with a full five year warranty against manufacturer's defects on the power supply ; a ten year guarantee on the water chamber; and a one year warranty on lamps and UV intensity monitors. Q. 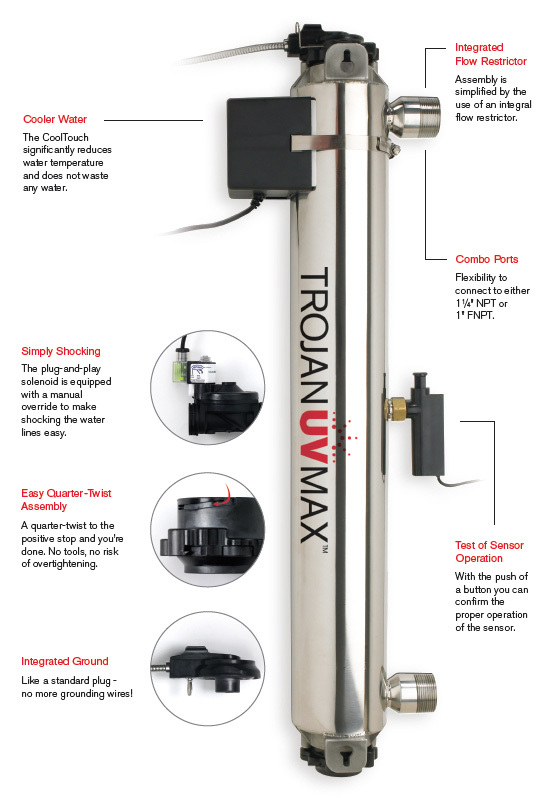 Why is it recommend to pre-treat the water before installing a Viqua UV Max System? A 5-micron sediment pre-filter is recommend to remove dirt and debris. The reason for this pretreatment is the quality of the water can not only affect the dosage of UV disinfection the system provides, it may also cause premature "sleeve fouling" which will require the sleeve to be cleaned more often, and may also damage the UV sleeve. Q. What is a CoolTouch Kit? The Cool Touch kit is a feature that will release hot water from the UV chamber before the water inside the chamber reaches a temperature in which the UV Intensity Alarm is tripped. This Kit is required for models that include a UV Intensity Monitor. Q. What makes the Viqua UV Max light more effective than other on the market? The Viqua™ Pro Series comes with a full 5-year warranty against manufacturer's defects on the power supply ; a 10-year guarantee on the UV chamber; and a 1-year warranty on lamps and UV intensity monitors.